Know someone who needs a lift? Brighten their day by sending this lovely bouquet of fresh flowers that has sweetness woven right in. 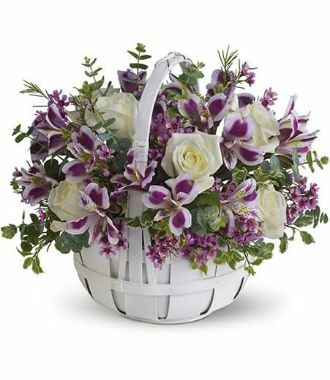 Gorgeous white roses, purple alstroemeria, lavender waxflower and eucalyptus are perfectly arranged in a white basket.